I'm new to Gravit, and to design in general (trying to create some labels for my business). Loving the program thus far, very intuitive. However, what I can't find is whether I can create simple pattern fills (similar, say, to a pattern fill for charts in Microsoft Excel). I have created some shapes on my canvas and would like to fill them with a checkerboard design, polka dots, etc. Any help appreciated. 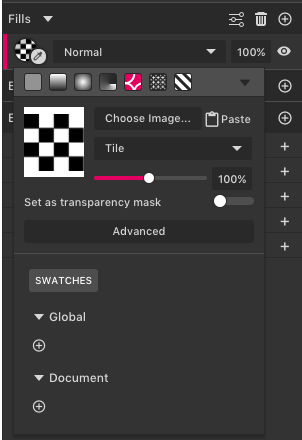 Inside the color selector, you will find the texture fill, that allow the usage of patterns, you can import one from your computer os simple copy a object and paste it as a pattern. We have a little bug there that you need change the pattern size to it be displayed, that will be fixed asap. Thanks Pablo. I've using the pattern fill by copying an object and it seems to be working great as I learn to use all the features. A new problem I have though now is that the patterns don't seem to be vector based. When I export my file as a PDF at 300dpi, and then open in Adobe and zoom all the way in on the patterns, they're very pixelated. Is there a way to correct this, or another solution to create pattern fills that are vector based? Similarly, I've inserted an EPS image into my gravit file (our company logo), but when I export the gravit file to PDF it too becomes very pixelated. What am I doing wrong? Eps is not supported by now in Gravit, please convert the logo to svg before using. About the patterns on pdf exporter it is a bug of pdf, nice catch! I will fill a ticket to fix it asap. What do you think timing is to fix the pattern fill bug? I ask only because I need to get my designs to my printer very soon and if this will take more than a few days I'll need to find another solution. I think it will take more than few days but a quick work around is export the pattern area as a 300dpi png and re-insert in the design. Due our png exporter have no problems with it. Or export all the design as png format. I did as you suggested and exported the pattern as a png at 300dpi. However, when I use that image to fill my original design it is pixelated even before I export. So either that didn't work, or more likely, I've done something wrong. And to your second point, I believe my printer requires files in EPS or PDF format, so I can't export my design as png. Can you share the file with me to i take a look? When you use the pattern on your original design, are the document size the same? If the original document is print document, it may require a higher resolution pattern. What is the best way to share my gravit file with you? The uploader does not allow my gravit files. @Lim, the files should be the same size. I created the pattern using an object in my main design file. You can share in google drive and post a link here. Let me know if those links work. I have increased the overall size of the document by 3 times, it will solve the print blurriness in patterns by now, you can quick tweak and fix it in the attachment file. I will try this with my other files. Is there an easy way to simply enlarge an entire file by 300%? You can scale it up with the transform tool. But all inside patterns need be fixed after.